What dimensions did you use for the tapered cone (frustum) ? I don't recall you stating the dimensions in this post: http://forum.nasaspaceflight.com/index.php?topic=36313.msg1317866#msg1317866 . Sorry if it is in some of your other posts and I missed it. Ok...so if I am following the latest exchange correctly, then these devices dimensions MUST be in complete sync with the given frequency in order for them to work at all? Or do they just function very poorly if the match is not exact? I also recollect long posts in the other thread about how difficult it was to attain and maintain the correct frequency - something about it shifting? These are cavity resonators that use the Quality Factor Q to achieve greater response. So, definitely you have to be at a peak resonant frequency to achieve highest Q. But what we have been discussing as of late, besides Q and frequency is the mode shape: the shape of the electric and magnetic fields inside the cavity at a given frequency. There are an infinite number of possible mode shapes inside a cavity (considering all frequencies). Even in the MHz and GHz frequency ranges there are several natural frequencies and associated mode shapes to consider. The question is what mode shape may be most effective for thrust generation. This is the emphasis of our discussion: how to achieve the greatest level of thrust of an EM Drive for a given level of inputpower. On seeing the cavity geometry revisited, I will just mention that my measurements were of necessity of the outside of the cavity. The inside dimensions would be smaller by the amount of copper thickness. As I recall, we estimated the copper cone to be most likely 1/32" copper and the end copper ground plane on the circuit board to be ~ 2 thousandths of an inch. I did a Google search for circuit boards, and found that they are rated in ounces of metal per square ? something 1, 2 and 3 oz. plating being common. Translated to thickness it came to 30-40 microns, 65-75 microns and just over 100 microns. I dropped that line of investigation an went with the 2/1000 estimate. As for the cone thickness of 1/32 inch, I think I gave the pixel count for the 1 1/2 inch square beam end which I believe it puts 1/32 inch on the order of 1 pixel. But my measurements of the outer dimension are also at best, on that order so I don't know what kind of wizardry it would take to pull up a better estimate of the inner dimensions of the cone. There it is, if anyone wants to take a shot at further correction to the big and small diameters. Add: Of course one could just subtract the thickness from the radius. And I note that the small end diameter is the diameter of the dielectric, so it is already the inside diameter. I been in contact with NASA on this and the lack of direct response has been marked. They will talk about the warp drive and other work, but will not even mention the EmDrive in their replies. It's as though they cannot speak its name...I also have it from other sources that NASA have requested that they do not discuss NASA's work in this area. If you can find any official NASA public comment on anything related to their EmDrive work I will be impressed! It does look like a blackout to me. The info about Shawyer not using dielectric section was in an email from the man himself. "Here, we review the derivation of the equation of thrust of Shawyer’s thruster, by obtaining a new expression, which includes the indexes of refraction of the two parallel plates in the tapered waveguide. This new expression shows that, by strongly increasing the index of refraction of the plate with the largest area, the value of the thrust can be strongly increased. " What happens if another country wheels a drive out, haven't others been working in this area? You are exactly right, I've been (inadvertantly) calculating w/ DIAMETERS ! I've got to stop using Post-it notes ! "The man with insight enough to admit his mistakes comes nearest to perfection." Keep doing what you have been doing, as it is only thanks to you that we have a thrust equation incorporating the mode shape, and thus thanks to you that we are (only now) able to investigate optimum mode shapes and therefore have greater insight into what is going on ! I plan today to run the calculations again using the volumetric mean instead of the geometric mean (I expect little difference, but just to confirm). Next I plan to calculate mode shapes for the Shawyer experiments (as nobody has ever discussed the mode shapes involved in Shawyer's experiments). Great ! In my 2 minutes at a time I'm off to figure out why df/c = the momentum, but in the accelerated frame of reference. "We find these shape-preserving Dirac wavefunctions to be part of a family of accelerating quantum particles, which includes massive/massless fermions/bosons of any spin." Interesting work by MIT PostDoc ! If NASA really decides to go silent on this, that would be a strong indication that the effect is not only real, but imminently useful. For those in the administration that might feel going silent is the optimal approach, I would suggest to them otherwise. Attempting to impede and to cover such information in the age of the Internet is futile. Though it may slow the efforts within the U.S. to reproduce and harness the effect, this is a multi-national effort, and the advancement and evolution of our species will continue in its progression despite such efforts. To any and all leaders within NASA or other governmental organizations whose first reaction is to suppress, please consider that such an approach is very 20th century. 1) I have re-run the calculations using the Volumetric Mean instead of the Geometric Mean. Please compare the results shown below using the Volumetric Mean with the GeometricMean results previously shown in post http://forum.nasaspaceflight.com/index.php?topic=36313.msg1319117#msg1319117 . 1) At the frequencies tested by Brady et.al. , what mode-shape corresponds to a given frequency is very sensitive to the exact geometrical dimensions of the cavity. The reason for this is that there are many natural frequencies very close to each other, each of these frequencies having different mode shapes. Therefore, the above-given Fornaro and Aero guesses of the dimensions of the Brady et.al cavity give very different mode shapes for a given frequency. EDIT: Actually, using the Aero dimensions, all cases run by Brady et.al, correspond to transverse electric (TE) mode shapes, using either the Geometric Mean or the Volumetric Mean to estimate the equivalent cylindrical diameter. I think that the TE mode shapes are the one that should provide thrust because it is only the TE mode shapes that have the magnetic field directed along the longitudinal direction of the EM Drive. 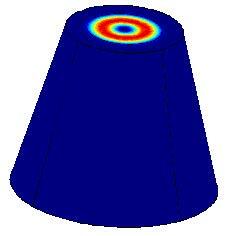 Physically, an axial magnetic field may result in a measured thrust either 1) as an artifact, because the magnetic field can heat the flat ends of the truncated cone and hence produce thermal buckling or 2) as a real means of propulsion, by the magnetic field coupling with the Quantum Vacuum, for example. 4) Using the volumetric mean in all cases, the errors are smaller using the Fornaro estimate of geometry, while using the geometric mean in all cases, the errors are smaller using the Aero estimate of geometry. Conclusion: this may be fortuitous and it may not be something to discriminate between the two estimates of geometry. 5) Using the volumetric mean leads to more stable values of mode shape with variation in frequency than when using the geometric mean: it gives mode shape 31 for all Brady cases. it would be extremely difficult to predict what mode shape one will get with a given geometry at these frequencies, because small variations in geometry lead to large changes in mode shape. Certainly it would be impossible to predict the mode shape of an empty cavity with the coarse finite element model used by NASA Brady et.al. Hence the function of the dielectric polymer is to force the cavity to function into a preferred mode shape. For NASA Brady et.al. they used a doughnut-shaped dielectric polymer to try to force the cavity to operate in TE01 mode shape (constant electric field in the circumferential direction). The calculations show that Brady experiment"c" was the closest to be such a mode shape while experiments "a" and "c" were much further apart. Hence experiment "c" resulted in a much larger thrust per PowerInput with the dielectric polymer having a constant electric field in the circumferential direction and the rest of the cavity having a constant electric field in the circumferential direction with a half wave amplitude in the longitudinal direction, resulting in a mode TE012. The polymer dielectric will produce an extra longitudinal half wave in the dielectric polymer, resulting in two half waves in the longitudinal direction of the whole cavity: 1) one half wave within the doughnut-shaped polymer dielectric itself, along the thickness of the doughnut and 2) the other half wave within the longitudinal direction of the rest of the empty cavity that has no dielectric polymer. 7) So, an optimal design of an EM Drive would proceed as follows: first decide what mode shape provides the largest thrust per power Input. Then design a dielectric polymer shape that would best force this mode shape. Then model the geometry of the cavity such that the rest of the cavity is also in the same cross-sectional mode shape (to amplify the resonance) and accurately model at what frequency this occurs. Thinking about potential historic parallels, they ought to be seriously considering to avoid another Sputnik moment. It is possible they would want to use it in military projects in the short term (endless autonomy/re-positioning satellites would revolutionize spy sats and anti-sat warfare). But there is the Chinese interest in it too. If they verified it works, they could be already working in military applications, and probably on a few civil ones. Unlimited range space probes would be a very good publicity stunt for them, for proving their technical superiority. A case perhaps of shutting the stable door after the horse has bolted. Would you say it's a case of shutting the stable door after the horse has bolted? It probably is, but I don't think it would be an attempt at censorship by making all information about this a secret. That horse already left the stable, as you say. In all probability (if they already know this exists and works outside of the public peer review process) they are trying to prevent the spread of sensitive "next step" information, allowing potential enemy powers to quickly develop the same technology, just by reading the same public reports we on the Internet do. It's not the first time I have read people pleading for keeping the reports about Q-thruster technology a secret, because in case of being true, they would certainly be matters of national security. So does that mean we shouldn't except to hear anything more from the US on this & if that's the case what does that mean for civil applications? Yeah that article on Physorg http://phys.org/news/2015-01-analysis-self-propel-subatomic-particles.html made me do this (see below), because it is relevant to what we're exploring here and what a surprising result! Also Marin Soljačić is the professor cited in the evanescent wave explorations from thread 1. This thread is exploding! once again thanks especially to @Notsosureofit and @Rodal. I really think a milestone happened here over the last couple of days. I wish I could bring the bacon like those two have but I'm kinda stuck in a rutt on figuring out this QV deal. The above quote (it popped out to me too) and what it means, could actually drop the QV model by changing the way we think about how to conserve momentum. It also sounds eerily like dispersion too. Break: I've seen anecdotal evidence that using the math for a resonant cylinder is "close enough" for a conical frustum. I can find references again if you wish where I found this. But I'm not so sure if this is a good approximation. Anyone know anything about cylindrical coordinate systems? I just started trying to figure this out. I don't believe they can prevent any public disclosure of undeniably working prototypes by the Chinese, in a few years (or months). So they probably are just buying some time for having a working version on our side by then. That or someone on NASA became aware of the potential huge embarrassment this represents, and told all the guys off and ordered them to pretend it never happened. But as H. White et al seem to be still working at NASA, I somewhat doubt it's a case of disowning a blunder. Or at least, I hope so. isn't it infinite? So science has sort of looked the other way and declared it a SEP (Hitchhiker's Guide reference meaning someone else's problem) while they got on with the bits of the math that doesn't make them uncomfortable?